I wrote earlier about getting the boss onboard with your ITSM improvement initiatives. You can't stop there, and you actually can't even start there! It is critically important to ensure that you get your own team invested in any ITSM plans before you head to the C level table, if any team members feel disenfranchised, under consulted or, even worse, ignored, then, no matter how good the support from above, or how much of a budget you have, you are doomed to failure. I know that you do "get" all this ABC (Attitude, Behaviour and Culture) stuff, but sometimes we all need to be reminded of just how important that people factor can be. If you don't do it right then you are quite likely to find a Trojan horse in your midst and have your improvement initiative sabotaged from the inside. Once again this is a lesson I learned the hard way. I found out that you cannot afford to neglect the people you work closely with...a little bit like the old advertising jingle that all New Zealanders were subjected to a few years ago - "don't leave home 'til you've seen the country" - don't look for support outside of your closest colleagues until you are sure that you have them onboard! As I mentioned in my very first post on this blog, I took ITIL (propaganda perhaps?) hook, line and sinker, I was a born-again ITIL zealot and I was determined that this was the one way, my personal "42"*. I could not imagine how anyone could not "get it" like I did, especially anyone who worked in IT. Now, please don't get me wrong, I still believe that ITIL is a very valuable tool when planning for ITSM improvements, I have just learned to take the ITIL wisdom, mix it with some of the great stuff from other frameworks, along a pinch of common sense to find the right mix for the business I am working with at the time. So where did I go wrong with my own team? Basically I just didn't pay enough attention to them, I assumed they agreed with me, I concentrated on gaining the support I needed from management and I didn't hear the little gripes and grizzles that were coming from the desks around me. I found, to my detriment that this was a big mistake...and that mistake hit me at the worst possible time. I was given the luxury of half a day, every day, for eight weeks to prepare a case, project plan, budget and everything else I needed to present to the management team to get this ITSM improvement plan off the ground. That, in itself, was a huge coup, and proved that my immediate manager was behind the idea (either that or he REALLY wanted to get me to stop annoying the hell out of him with all my ITIL evangelism!). I poured myself into this project and was pretty happy with the material I put together at the end of that time, I still have the slide deck and had a quick look at it the other day, it wasn't too shabby - I wouldn't use it now as it is too ITIL centric and probably a bit unrealistic in the outcomes that were promised to the business....nothing too major, but in the intervening years I have learned the art of under-promising and over-delivering. What I didn't do during this time was listen to my own advice on active listening - I talked AT people in my excitement about ITIL and ITSM. I didn't listen to their concerns about what this initiative could mean to them. I did not read between the lines and I shrugged off the jokes and little grumbles about my "pet project". I didn't hear how one network admin felt that change management processes would completely change his life, stopping him from just coming in over the weekend and patching servers, doing upgrades while the building was empty and the systems were unused...if I had heard that I could have made him understand that this didn't have to change, but he did need to properly plan for these changes before implementing them...that would have saved the service desk a lot of grief every Monday morning! I didn't see that other members of the team were concerned that they would have to spend half their time documenting stuff rather than doing it - had I listened to that concern we could have discussed the idea that documenting something once meant it was there for everyone to use in future and it may save them a callout in future. Hindsight is a wonderful thing. What did happen was that a couple of key members of my team got the ear of the CFO and voiced their concerns behind my back. They persuaded him that ITIL was just a fad and was not really necessary in a business of our size. Well before the presentation he was already convinced that it was a bad idea and I was well and truly set up to fail, and by people who I thought were right behind the initiative. After my abortive presentation I did a lot of soul searching and worked out what I had done wrong. It took me a full year to gently nudge my colleagues in the direction of best practice. 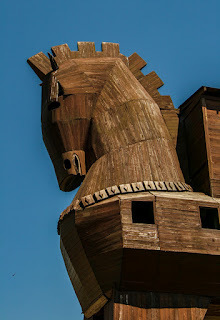 I understood that the bulldozer approach was just not going to work, so I concentrated on feeding snippets of ITSM goodness to them, eventually it did work and we dismantled the Trojan horse, one board at a time. We got another chance to go for that management support and the second time around we got it....this time is was WE not I, and that is what made the difference!